The Twelve Hours of Sebring ended several days ago, and as I sit at home with a hot cup of coffee, I’m still utterly exhausted yet on such a high from the weekend. 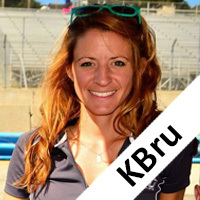 That’s not because the KBru Comm clients had good results (spoiler alert: we didn’t), and it’s not because we had amazing weather on one of the most demanding race days of the year (spoiler alert: we didn’t). It’s because of the fans: The casual spectators, the general enthusiasts, and the superfans. I have a to-do list as long as a CVS receipt today, but I’m going to take a moment to tell you why this group of fans is so incredibly awesome. 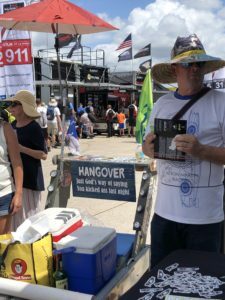 The fans that come to Sebring International Raceway for the Twelve Hour are as fun as it gets. Not only do they come dressed in all kinds of crazy costumes and camp out in all kinds of weather conditions, but they come from all over the world to this tiny town in Florida for a few days of hanging out with race cars. This weekend so many social media followers made it a point to stop me and introduce themselves, which is always so darn cool. I met Martin, who came all the way from Europe, and even stayed a while to chat racing, social media, and to also meet with the drivers. Rob, a motorsports photographer from Florida stepped out to make an introduction after following my clients for a while. I met the four members of the Price family who drove all the way down from near Bowmanville, Ontario for their Sebring visit. 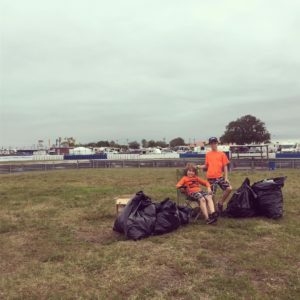 Not only did the parents and their two incredibly sweet sons come over a couple times to say hello and chat, but after the race, the family stayed behind to pick up trash for an hour from the turn three viewing area, collecting five bags of garbage, determined to leave the track better than how they found it. We also have Michael and our entire gang of Florida fans, also known as Team Tutu, as well as Kevin and Michael, who came all the way from California for a couple weeks of racing in the sun (well, and rain). There’s Sean, who came all the way from Seattle to get soggy in Sebring, and to the Flying Lizard fan trio I met at the Styled Aesthetic apparel tent, I can’t remember your names for the life of me, but it absolutely made my day talking to you. In addition to the fans at the event, the ones watching and participating via web streams and social media made it so enjoyable. Following the #Sebring12 hashtag on twitter and Instagram, it was so much fun to see the event through the eyes of so many fans and participants. If you don’t use official event hashtags in your posts to connect with other people’s content, I highly encourage it. Over the last couple of years, social media has taken such a toxic turn, with the negative minority overshadowing the positive sense of community that built so many incredible relationships and led to so many new ways for participants to interact with fans. In response to social media no longer being a positive away to connect with fans, several drivers have admitted to me their quiet withdrawal from sharing their own viewpoints about anything or sharing personal aspects of their lives. There were even times where some of my own clients have declined PR opportunities because they had little interest in rewarding the negative environment. We’ve all been there. However, over the last few months, something has shifted, and Sebring is proof of it. I can’t describe the electricity that was in the air, but it was hard to ignore. Even as the rain poured down on the pre-race fan walk, and participants huddled in pit boxes to stay dry for what would be an incredibly long day, fans still came out to see the cars up close. Although completely drenched, there were those beaming from ear to ear, soaking up the atmosphere as IMSA Radio’s pre-race show blared on the track PA system. Traffic on Facebook groups was some of the highest I’ve seen from recent events, with fans sharing their experiences and photos throughout the weekend, interacting with each other, and having real conversations about what the weekend had in store. I’m so thankful for a sanctioning body like IMSA that sees the value in a strong, positive fan base. 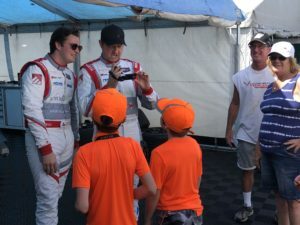 IMSA does so much more than a pre-event promotional tweet and a mandatory autograph session. Everywhere you went in town and walked around the circuit, you saw the fruits of IMSA’s labor, creating interest and activation for its fans. Restaurants, bars, and stores all over town had race themed signs or products celebrating race week. At the track, the series hosted VIP tours, giveaways, responded to fan messages, shared team content, worked with participants to create unique content on the fly, shared fan stories, hosted live stream shows for fans to watch and attend in person, provided a live DJ in the paddock, had informative signage everywhere for new fans, and the list goes on and on. With the FIA WEC present at the event as well, it would have been easy to tune down a lot of these activities and focus on a smooth combined event. 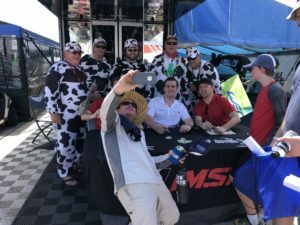 But the time and effort IMSA, WEC, and the Sebring staff put in for a stellar event showed, and the fans and participants were better off for it. While all this seems like it should be common sense for a series to do, it isn’t. It can sometimes be incredibly difficult to convince the powers that be why we should make the fans a priority, especially when the angry mob rears its head, crying for attention like a nap deprived toddler. But the extremely positive response from the fans, both in person and on social media, is great indicator for what we can do moving forward. So what can we do to keep this momentum going? Participants: Remember that fans are the customers too. Sure, we want to compete and win, and be innovative in our technology, but we also want to connect and build relationships with the consumers and increase our appeal to sponsors and partners. Continue to reward the fans who contribute positively to the sport. Find your own ways to show them how much their enthusiasm is appreciated. Fans: Continue to participate and give positive feedback on event activation and team/sponsor interaction. Buy the merchandise when you can. Join the social media conversations and continue to invest your time and energy in other fans and groups who also want to build the sport up and see it grow. Don’t give attention to the negative circles and be sure to like, share, and comment on posts from the series, drivers, and teams. Those stats matter when we pitch sponsors or PR initiatives. Keep all your fun photos and posts coming, and tag the drivers and teams. Ask questions during a race. If a team or series goes out of their way to do something for you, share the experience. Once again, to everyone who joined in the Twelve Hours of Sebring all over the world, thank you. I hope to see you at the next round. Previous: Previous post: But How do the Grid Girls Feel About It? Sebring had been on my to-do list for a few years, so when they added the WEC race, it became a much easier decision. None of my Le Mans buddies would commit to it, so in the end I travelled alone. It was a long trip, but well worth it and delivered almost all I had expected. Dripping with history, a little run down and ram-shackle, very much aware and proud of the past. The open paddocks, the pre-race grid-walks, the wide expanses of concrete. The bumps out of 17, Turn 10, Green Park. The battles into the hairpin in front of the hotel and the drag-races out, all the way to 10. It was cool to see the DPIs and the GTD cars up close, having known them for so long via the fabulous IMSA livestreams. (The P2 & GTLM cars I already knew from the WEC.) Racing cars after dark are spectacular and wonderful, but the 12 hour format meant this endurance race began to feel like a sprint as the daylight faded, and of course built to a stunning NASCAResque “debris on the back straight” yellow-assisted climax. I don’t suppose they’ll ever come across this, but a big shout out to Miguel, ET & California Paul of F-Troop, along with the guys and gal looking after their, ahem, tiki bar on Saturday night, and way too far into Sunday morning. They made my visit even more memorable, if a little more hazy! So if anyone’s going to be at Le Mans, hit me up, I’d be glad to return the favour. Almost all I had expected ..? I was a bit Tommy Milner, and hoping for a spectacular Sebring sunset, but it didn’t materialise, so I guess I’ll just have to come back at least one more time. Sebring you lovely old thing, this could get very expensive. Martin (All the way from Europe). Kelly, you are bang on! I was there for the team car tour for the price kids. It was pretty special for the kids and adults. I wish more teams took the time to do this. That said the interaction is like no other and is the best fan experience already. It was my first time at Sebring, found it a bit strange at first walk through camping areas, but soon found it increasingly fun and now realize it is a great part of the iconic race.